The social fund funeral payment helps claimants who are on a low income during a time of loss. It can cover the cost of arranging a funeral for the deceased person. DWP FUNERAL PAYMENT: This death benefit comes from the DWP Social Fund. Funeral Payment eligibility, and how you make a claim to cover the cost of a funeral, is dependent on your financial circumstances. The relationship status that you had with the person who passed away may also affect your claim. DWP usually exclude personal savings from the eligibility criteria. But, they can include money from the deceased person's estate (if there is one). They may use it towards repaying part, or all, of the Funeral Payment assistance awarded to you. As a rule, the estate of a deceased person includes any property or savings they had. But, it does not apply to a house or any personal assets left to the widow or widower (or surviving civil partner). DWP Funeral Payment How Much Will I Get? The amount awarded for Social Fund Funeral Payments DWP depends on several of your personal circumstances. The burial fees as well as exclusive rights to burial in a particular plot. Fees for cremation (including the cost of the doctor's certificate). Up to £700 worth of funeral expenses (e.g. coffin, flowers, funeral director fees). Travel costs for arranging or going to the funeral. The costs for moving the body within the United Kingdom (for the part of the journey over 50 miles). What happens in cases where the deceased person had a pre-paid funeral plan or insurance policy? You can only receive monetary help (up to £120) for items which are not covered by the funeral plan. The official reference section of the DWP Funeral Payment Claim Form SF200 lists all the items and inclusions. The UK funeral grant from the Social Fund often goes directly to the funeral director. This happens if their costs are still outstanding (not paid). The money gets paid into your secure bank or building society account if the fees are already settled. Be getting certain benefits or tax credits. Meet the rules on your relationship with the deceased person. Arrange the funeral within 3 months in the United Kingdom, the EEA, or Switzerland. The partner of the deceased when they died. A close relative or close friend of the deceased (and reasonable for you to accept responsibility for the funeral costs). The parent of a baby stillborn after 24 weeks of pregnancy. The parent of the deceased child, or have been responsible for the deceased child, if they were under 16 (or under 20 and not in full-time education). Note: You should contact the Social Fund to check your eligibility if the funeral will take place in Switzerland or the EEA. Person you have married (or a person you live with as married to them). Civil partner or person you live with as if you are civil partners. Note: Getting a Support for Mortgage Interest loan means you may still qualify. The total amount depends on whether there is other money available (e.g. from the estate of the deceased or an insurance policy). The deceased had a partner when they died. Aged under 18 or qualifying young people for the purposes of Child Benefit. In prison or in hospital (awarded a qualifying benefit immediately before they went to prison or hospital). Asylum seekers supported by the National Asylum Support Service. Family members not normally resident in the United Kingdom. There is a close relative of the deceased, other than a close relative in one of the excluded groups listed above, who was in closer contact with the deceased than you were, or had equally close contact and is not getting a qualifying benefit. You may get help in other ways if you do not qualify for a Funeral Payment to help cover the cost of a funeral. You may be able to use money from the bank account of the person who died, for example. You should use the DWP Funeral Payment SF200 Form. You can also apply by telephone. There is a claims time limit and you must claim within three months of the funeral. Different procedures apply if you live in Northern Ireland. Go ahead and make your claim even if you are still waiting for a decision on a qualifying benefit. The same applies even before the funeral takes place if you are in possession of the invoice from the funeral director. Estimates are not accepted - as a rule. 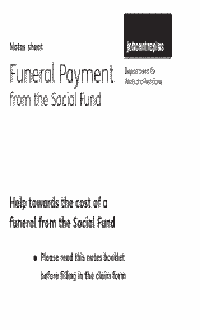 Print out the Funeral Payment SF200 claim form and take it to your local Jobcentre Plus. You can also mail the funeral benefit claim form without charge to 'Freepost DWP Funeral Payments'. There is no need to apply a stamp or write a postcode on the envelope. When you call the Bereavement Service helpline you will get access to their adviser. They can also help you to claim any other bereavement benefit entitlements that may apply for your circumstances. CALL CHARGES GUIDE: Check the rates for telephone call charges from a landline or mobile. Call charges vary to popular numbers like 0800, 0808, 0845, 0870, 03 and others. You can appeal to the Social Security if you feel unsatisfied with a decision on the death benefits system. A change in the rules means you must request 'mandatory reconsideration' by the office before you lodge your appeal.